Most of the Protected Areas (PAs) in India have religious monuments/ installations which see an influx of visitors throughout the year and peak numbers during festivals. In most of these PAs, it has been observed that during these celebrations tree felling, animal sacrifices, use of loudspeakers and open-air cooking are rampant, not to mention the plastic litter and the filth that is left behind. With the number of devotees running into thousands and even lakhs at some places, effective management of pilgrim traffic is a big challenge for the management of Protected Areas. If not handled with care, it can have a severe impact on the conservation of wildlife and jeopardize the objective of Protected Areas, leading to habitat degradation and loss. Well planned and effective management of this issue with support and cooperation of all the stakeholders is crucial for reducing the negative effects to a minimum and is a matter of significant concern that needs to be addressed in the conservation scenario. In view of the concern stated above, it was planned to ascertain the effectiveness of regulation strategies implemented to control the influx of pilgrims into Protected Areas. 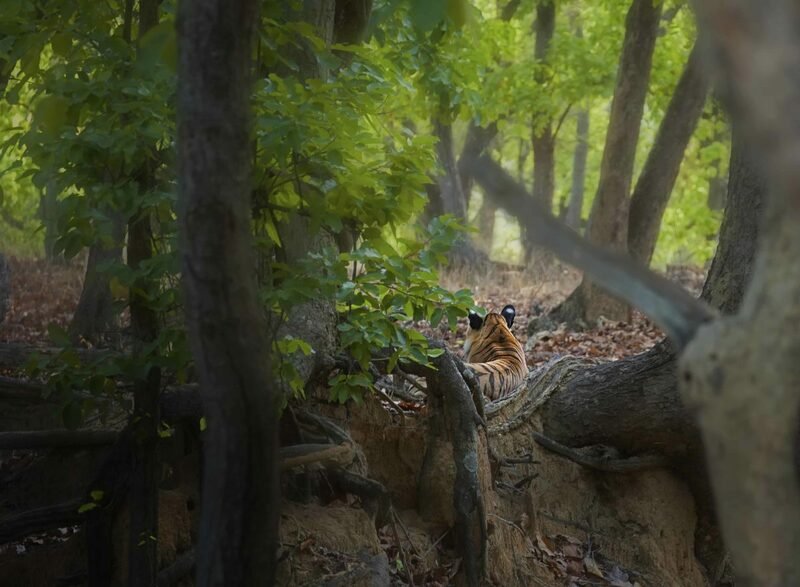 Bandhavgarh National Park, which enjoys a central location and excellent biodiversity, also houses a very old temple that sees thousands of worshippers from the local communities every year. This was chosen as the location for the study. 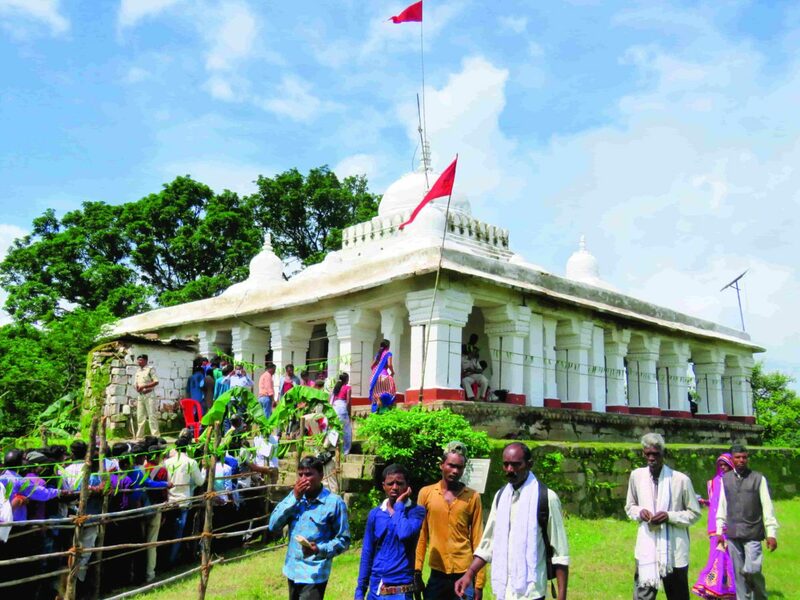 A study was conducted during the Krishna Janmashtami fair when the Forest Department allows pilgrims to enter the park to worship at the Bandhavadheesh temple inside the Bandhavgarh Fort located in the Core Zone of the Bandhavgarh National Park. The study conducted aimed to determine the effectiveness of the management of the Janmashtami festivity and to ascertain if it was a successful model. Bandhavgarh National Park is dotted with about 32 hills and hillocks of the Vindhyachal range. On the highest one, about 811metres high, is the Bandhavgarh fort, resting on a plateau spreading over 4 square kilometres. This iconic fort, considered to be 2000 year old, was once a stronghold of Baghela Rajputs and known by the name of Moti Mahal. The Bandhavadheesh Temple located inside the fort, has statues of Lord Rama, Sita and Laxmana. Bandhavgarh has been ruled by different dynasties with the Baghels finally taking over the fort in the 13th century. Baghel King Vikramaditya Singh abandoned Bandhavgarh fort in 1617 when Rewa, at a distance of 130 km from Bandhavgarh, was established as a capital. The Baghel King later declared Bandhavgarh as his hunting reserve which indirectly led to the protection of the habitat and wildlife in the area. The Fort is visible from almost every point in the Core & Buffer zone of the Tala Range. It is located at an approximate distance of 8 km from the Tala gate. On the occasion of the Krishna Janmashtami festival, thousands of devotees visit the Bandhavadheesh Temple. The temple has a Pujari, who is also a Forest Department employee and manages the wireless system. Daily offerings are made to the deity by the Pujari though devotees are not allowed inside the fort area except on the three designated days of the festivals. To collect information, the research team visited Bandhavgarh National Park and recorded data on various management strategies implemented by the management of Bandhavgarh National Park. To determine the impact of human activity, the research team conducted a pre and post survey of the area. To determine the impact on the distribution of wildlife, vehicle transects were conducted pre-fair and during the fair. In addition to this, semi-structured interviews were conducted with all the stakeholder’s managers of Bandhavgarh National Park and also with pilgrims, village representatives and shop-owners. To find out any negative impact of pilgrim influx on the protected area, sampling was conducted at 3 sites after the completion of the fair namely at the location of installation of shops, on the way to the fort and at the fort. The trend in a number of pilgrims over the years: On comparison of data of pilgrims visiting the fort during the Krishna Janmashtami fair, it was found that there is no clear trend in the number of pilgrims. 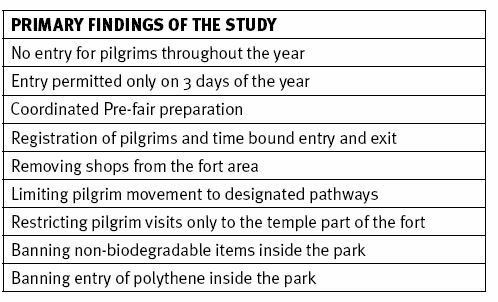 In 2013, 9491 pilgrims went inside the forest while in 2014, 15672 pilgrims went inside the forest which clearly indicated an increase in the number of pilgrims but in 2015 and 2016, 10000 and 11667 pilgrims respectively went inside the forest which indicated the decrease in the number (Table 1). *Exact data for 2015 is not available with Forest Department as, after entry of 5000 pilgrims, management allowed pilgrims without registration due to the huge crowd and it is estimated that another 5000 went inside without registration. Note: Devotees attending during other 2 festivals i.e. the birthdays of Kabir and Ramji Sen are much lesser in number and add up to only around 2500 every year. Krishna Janmashtami is the biggest festival in the area. Barring entry of pilgrims to fort throughout the year: The fort and temple remain closed for pilgrims throughout the year. Entry to the fort area is allowed only on 3 specific days of the year. Fort open only on 3 days in a year for pilgrims: The Park Management allows local communities to enter the fort only on three days of the year i.e. during Krishna Janmashtami and the birth anniversaries of Kabir and Ramji Sen. Even during these festivals the Forest Department manages the crowd well and minimizes the adverse impact on the wildlife and the habitat. Effective and coordinated Pre-fair preparation: To tailor the management strategies for the fair, The Collector (District Magistrate) of Umaria, calls a meeting of all the stakeholders (Forest Department, Revenue Department, Police Department, Health Department and village representatives) prior to the fair. In the meeting, various issues are discussed and duties assigned to various departments. Only after spot inspection and ensuring that everything is in order, is a go-ahead given for the fair. Effective management of a number of pilgrims entering the park: To manage the crowd effectively, the Forest Department seeks to support and cooperation from the Revenue Department, Police department and Health department. For effective management of the crowd during the fair, it is crucial to control the number of pilgrims going inside the park. To regulate the number of pilgrims, the Forest Department has initiated the system of time limit and grants entry only to pilgrims who register themselves at the counters set by Forest Department and reaches the Tala gate between 7 AM to 11 AM. The entry is closed after 11 AM and the visitors have to be out of the National Park before 5 PM to avoid any unpleasant encounter with wild animals, as wild animals are known to become more active after sunset. Restricting entry to the entire fort: Only the temple part of the fort is accessed by pilgrims during the Janmashtami fair and the entire fort is not accessible. Similarly, during the other two festivals, members of the Sen community are allowed only till Sheshshaiya while the followers of Kabir are only allowed to visit locations related to the memory of Kabir. This helps in minimizing any incidence of attacks by wild animals. Removing all shops from the Fort area: With consensus from all stakeholders, it was decided that all shops will be set up in Tala village, 1 kilometre away from the main entry gate. No shops were allowed in the fort area. Limiting movement to designated pathways only: To avoid any fatal encounter between the pilgrims and wild animals, pilgrims were informed not to stray away from designated pathways and a human-chain of Forest Department personnel was formed to have an eye both on the presence of any wild animals and movements of pilgrims. Banning non-biodegradable items: To prevent pollution inside the reserve, all the non-biodegradable items except water bottles were banned and the Forest Department and Police Department stringently checked every pilgrim going inside the park. Special women police and forest guards were deployed to check the women pilgrims. During our post-fair survey at 3 sites, we have recorded that there was no non-biodegradable waste near the temple except the water polythene pouch used by people involved in the management. While we did record pouches of Gutkha (Tobacco) on the paths used by pilgrims, the same were also collected by the Forest Department workforce the very next day. Banning Polythene inside the park: Forest Department banned the use of polythene inside the Park so most of the pilgrims informed that they did not carry polythene while some informed that they carried polythene bags inside the park to carry prasad and personal belongings but brought them back. Awareness creation about the ills of littering: To prevent littering inside the National Park, Forest Department used a PA system installed at the gate to inform pilgrims not to litter. Waste Disposal arrangements: Most of the pilgrims did not generate waste and whatever the negligible waste (paper packing of tobacco items) they generated, they put it in dustbins provided by the Forest Department. The Forest Department also set up barricades at road junctions to prevent straying pilgrims from littering the area. Natural dustbins were constructed at several places and placards informing pilgrims to use these dustbins were installed. Minimizing human-animal conflict: Before allowing entry to the pilgrims, area on both sides of the road used by pilgrims was checked for the presence of any carnivore. The rule was that if a carnivore was found, it would be pursued away from the road. First, the officer-in-charge of the fair (Sub-District Magistrate) conducted an inspection of the area and on finding everything in order, gave orders to provide entry to pilgrims inside the National Park. There was not even a single incidence of wild animals attacking pilgrims and vice versa. Stopping entry of vehicles inside the park: The park is closed for safaris during Krishna Janmashtami owing to monsoons. No other vehicle except management vehicles are permitted inside the park during the fair. Facility for urination and defecation: Forest Department provided for facilities for urination and defecation (especially for women) to prevent pilgrims using the bushes for the same. While there are few permanent structures, additional temporary structures of bamboo and cloth were set up before the fair. Wildlife affected but no threatening negative impact: The gathering of the crowd during the fair was found to have some negative impact on the wildlife as we have recorded only 2 groups of chital during the pre-fair road transect while none of the wild animals during the festival. The pathway used by the pilgrims goes through the grasslands, a preferred habitat for the ungulates. So the low density of ungulates during the pre-fair survey was because of disturbance created due to the presence of humans and for repairing the roads for the pilgrims. So we conclude that the fair does have some negative impact on the ungulate distribution. Forest Department informed that due to the crowd gathering, there is a temporary change in the distribution of wild animals and they move away from the areas close to the pathway used by pilgrims. 6 to 7 domesticated elephants which were normally used by the Forest Department for patrolling, were deployed at the sensitive points to keep an eye on the movement of carnivores and to pursue them away from the roadside. However, from the numbers and the pattern, we conclude that the crowd gathering did not have a threatening negative impact on wildlife. Environmental pollution inside the park: As polythene inside the Park was banned, most pilgrims did not carry polythene and the few who carried brought them back. We have recorded that there was negligible nonbiodegradable waste near the temple. Environmental pollution outside the park: Installation of shops outside the park generate a huge amount of polythene waste. Most of the shopkeepers (88%) use polythene as carrying bags and most of the items are sold in polythene bags (Figure 1). The shopkeepers either burn (25%) or throw away (69%) the nonbiodegradable waste somewhere else at a distance from the location where shops are set up. However, both the cases lead to environment pollution (Figure 2). The site where local people set up the shops i.e. about 1 km from the Tala gate had a significant amount of polythene. Shopkeepers burnt and disposed off some carry bags at the location itself. Though the majority of the carry bags were physically taken away from the site, they were again disposed off at some distance from the shop locations. Either way, this was going to have a negative impact on the environment of the area. 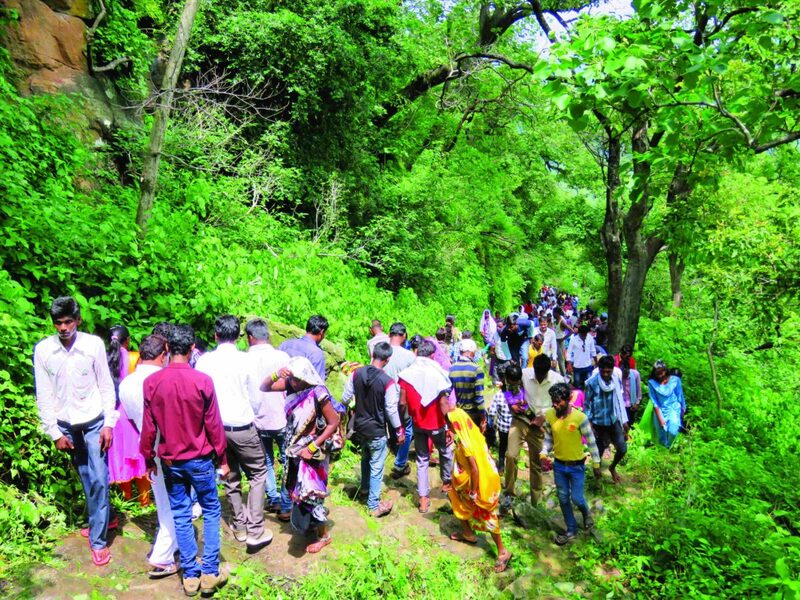 Drifting away from designated paths by pilgrims: Though the Forest Department managed the crowd very well, there were some stray problems in managing pilgrims who drifted away from the designated paths for sightseeing of the natural beauty of the National Park. 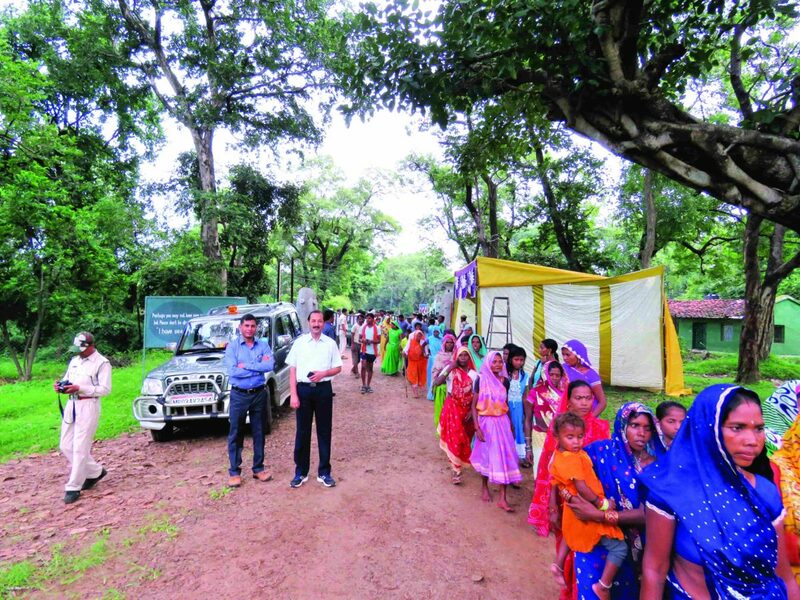 The study concluded that the fair was well strategized and managed by the Forest Department of Bandhavgarh and could be looked up as a best practice model to emulate. Success model based on Primary Findings: Restricting entry throughout the year except for three specific festival days, coordinated pre-fair preparations, removing all shops from the Fort area, restricting entry only to the temple part of the fort, effective management of number of pilgrims entering the park, limiting movement to designated pathways and banning non-biodegradable items and polythene inside the park are innovative measures that have showed results. Success model based on Supportive Findings: Waste Disposal using natural dustbins, awareness creation about not littering, minimizing human-animal conflict and facility for urination and defecation have further helped the management of pilgrims during the fair without adversely affecting the wildlife and its habitat. A significant improvement over the traditional culture practised in the area: Till 1968, devotees were freely allowed to visit the temple for worship on any day of the year. In 1968 when Bandhavgarh was notified as a National Park, the Forest Department restricted entry of devotees on any other day except during three festivals namely the Krishna Janmashtami and the birthdays of Kabir and Ramji Sen. After the sowing of the paddy (major crop of the area) people were free from agricultural activities and they relaxed and enjoyed the celebration for 3 days. Villagers and locals gathered and stayed at the fort for the 3 days. Entry was freely permitted as there was no registration system in place. Shops used to be installed around the temple itself. At this point, the area of Fort was still under the King of Rewa. In 2002-03, by the order of the Supreme Court following a petition by the Forest Department, the area of Fort was transferred to the Forest Department, who restricted the entry of devotees to one day and banned the installation of shops in the campus of the temple. Shops were now allowed to be set up only around the Tala Gate at a distance of 8 kilometres from the temple area. Soon after the takeover, Forest Department also introduced the registration system which saw a significant reduction in the temple traffic. Additionally, in 2015, Forest Department further shifted the installation of shops to a distance of 1 kilometre away from the gate of the Park. The study was undertaken to ascertain the effect of pilgrim traffic on the wildlife and the habitat at Bandhavgarh National Park. The study indicated that in spite of a substantial number of devotees visiting the park every year, the entire process was well strategized and executed and that the pilgrim traffic did not have a threatening negative impact on the wildlife inside the national park. The control of environmental pollution in the fort area was also implemented through stringent measures, which has been found to be a cause of concern in many temple areas in PAs across the country. All in all, this was found to be a well-managed and successful model worthy of implementation with region-specific modifications in other PAs in the country. Sharad Kumar has a PhD in Wildlife Sciences. He has conducted a long-term study on the ecology of the tiger in Corbett Tiger Reserve and has experience in operating statistical software. He is passionately interested in developing and working on innovative conservation ideas for large carnivores and birds and mitigation of human-wildlife conflict in and around the Protected Areas. He possesses front-line experience in wildlife research, training, teaching, fundraising and has authored four research papers published in the scientific journals. Currently, he is working as Deputy Director with The Corbett Foundation and is responsible for the administration and implementation of their Bandhavgarh and Kanha divisions’ activities, and coordination with various governmental and non-government agencies.